overall dimensions are 24 by 60 inches or 2 by 5 feet. 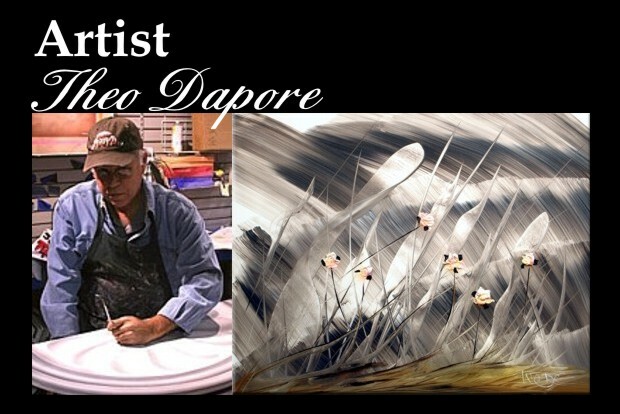 Artist Theo Dapore has been on the art scene for a little less than four years. The artist credits much of his success to his signature series Last Apple. 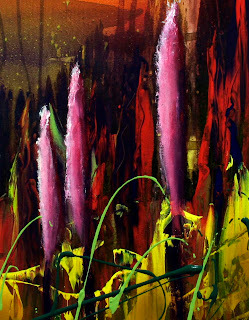 Poem and painting series has been with him from the start of his art career. He states the amount of exposure and the following the series generated quickly developed and gave the never herd of artist quick acceptance with consumers shopping art markets. The series as of 4-16-09 as had 292 original produced and 285 of the originals have been purchased. As a thank you to my clients and to those who sent messages to the studio in appreciation of the series my son Jeremy and I put together three different wallpapers that anyone who wishes may have. The three painting images have the poem inlaid and are available in two sizes. 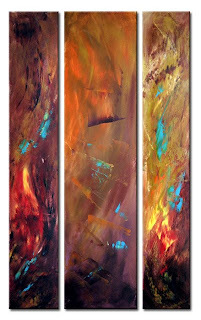 Abstract Thought 428 acrylic long slender triptych. 3 canvas 1-12x48+2-8x48=28x48 inches or 20.32x122 cm. 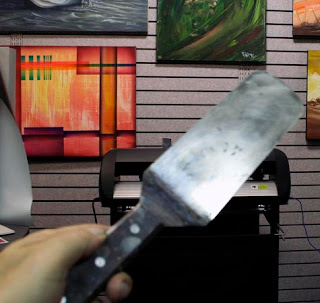 Interesting point about this piece it was painted with a carbon steel commercial hamburger flipper. In the future I will show some other examples of paintings produced with unique equipment. Styrofoam, plastic household broom, plastic wrap, standard household painting brush, and finger painting ect. 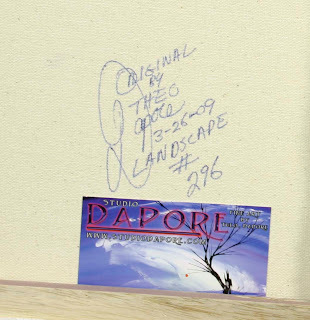 LANDSCAPE 296; is a original acrylic painting by Theo Dapore. 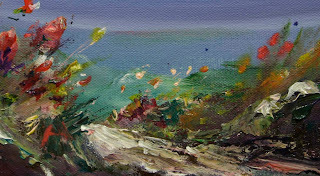 A soft pastel,background brush painted foreground is produced in palette knife. The painting mellow somber mood with constant lighting. 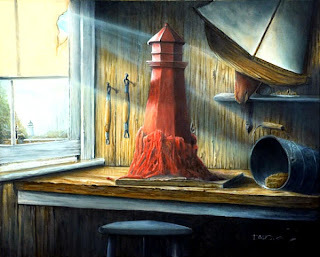 Lighthouse in Vermilion is a 24x30 inch acrylic painting. The theme is pertaining to Vermilion, Ohio which was named from the colored clay of the region that the Indians used to make paint. Vermilion is a harbor town located on Lake Erie. In referring to this work in progress my wife and I nick named the painting Double Play relating to its duel meaning title. No reference photos where used in this composition, however I did use a wooden decorative lighthouse of my wife's and the kitchen counter near a corner wall to calculate the angle for the basic layout angle. I have started a second painting that relates to Double Play which is untitled. It is of the garden area which is outside of the window. Content of the painting is the brick wall, a concrete lighthouse fountain, the toy sailboat, and the water bucket which doubles as sand pail with shovel. 24x30 inch acrylic painting. The theme is pertaining to Vermilion, Ohio which was named from the colored clay of the region that the Indians used to make paint. Vermilion is a harbor town located on Lake Erie. ABSTRACT THOUGHT505; is a original acrylic painting by Theo Dapore. 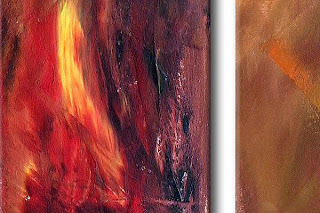 Rich in reds and a heavy abstraction texture. The leafless tree is done in a thick impasto which raises from the canvas. The canvas are a master series canvas .75 inches thick, with the wooden frame much heavier than a lesser grade prestretched canvas. Theo Dapore as of 3-20-09 is 54 years old. He has lived the majority of his life in Vermilion, Ohio and now resides in Dothan, Alabama. His studio is located in Wiregrass Commons Mall in Dothan. 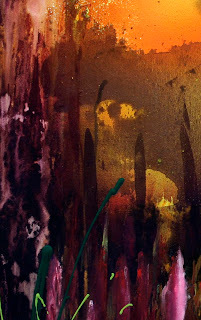 Theo's art career started with listing his fine art paintings in online art galleries in August of 2005. He has never been represented by any brick and mortar fine arts gallery. 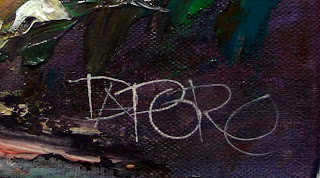 At this time he is developing his own unique style of art, a style that is distinct from other artists. Working acrylics wet into wet he combines broad blending with many other techniques into one painting. Making this unorthodox mix come together with continuity and a continual feel. When asked about the art, Dapore says he is in his original decorative art period. 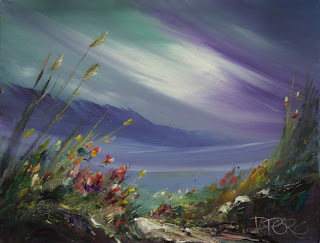 Working content of abstract, landscapes, seascapes and floral. From here he plans to refine the style that he has created by adding more definition and detail. The path is open for his art work to go in many directions such as abstract expressionism, art deco, abstract, surreal and realism. 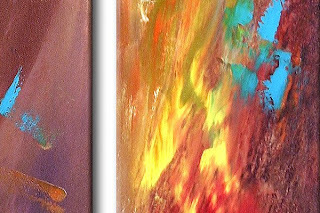 His efforts have been well rewarded with over 1200 of his original abstract art being bought. Almost 30% of his art has been picked up by returning clients that have become collectors of Theo's unique style. 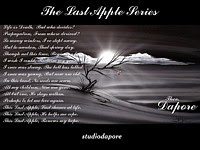 Dapore's signature or best selling series, The Last Apple, which is a painting and poem series. Originals for sale: 292 Originals sold: 285. 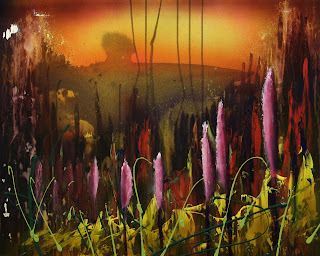 Some of the artists that Theo Dapore admires are James Coleman, Thomas Leung, Hong Leung, Roy Gonzalez, Thomas Kinkade, Christian Lassen and Howard Behrens.He hopes to allow these artists styles influence his own distinct techniques. 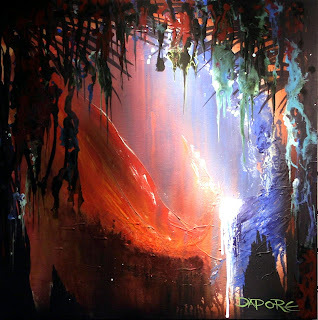 If you have an interest in the art of Theo Dapore feel free to keep visiting his online gallery. We believe he is in a transitional period at this time and the outcome should be interesting.